When you opt for cloud hosting with FolioLink you can upload thousands of files to the Supporting Files area in your account. These files can be linked, shared, and embedded in your website, blog and other online venues. We offer a way to organize your cloud content using a familiar folder structure to manage the large number of files you are likely to upload to your FolioLink cloud account. Cloud hosting not only gives you a way to upload thousands of files as large as 200 MBs, it also gives you a scalable infrastructure to deliver them quickly. Cloud hosting can be added to Turnkey, Premium and Pro Accounts. 1) Click on the Add Folder button. 2) Give your folder a name. 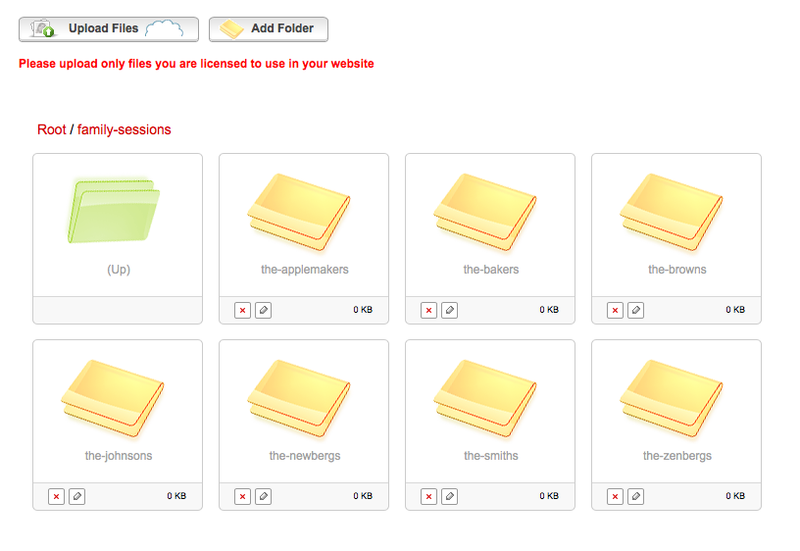 3) To add subfolders just click on a folder to select it and then repeat steps 1 and 2. All folders are listed alphabetically. Once you have added a subfolder a green folder will appear allowing you to navigate back up a level (i.e. to the parent folder). At any time you can click on the cloud upload button to batch upload files to the currently selected folder. Remember all of this organization is just so that you can find files efficiently. To share, embed, deliver, and/or link the files you have uploaded click on the link button below the thumbnail. The hosted file address can be copied/pasted so that you can share, embed, etc.